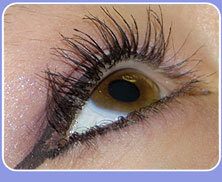 Eyelash perming involves small rods being placed on the eye lashes, followed by an application of perm lotion. It is perfect for people with straight lashes, or for those who do not have time to curl their lashes daily. It focuses, brightens and opens up the eyes. To further enhance the eyes, many people will tint their lashes. This gives the eyes a beautiful mascara look without the hassle of having to apply it! Effects last for up to 8 weeks.